Excuse me, But Do You Log? 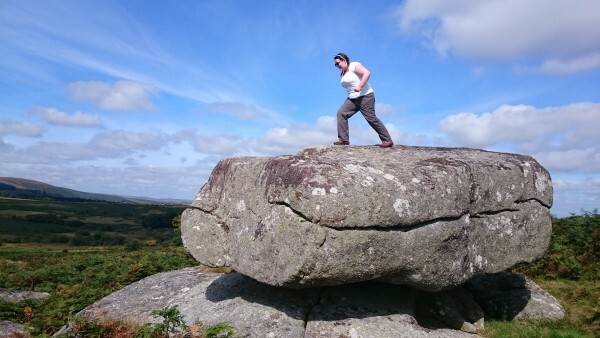 Dartmoor has a fair few logging or logan stones. They are really exciting, or they would be if you could find one that still logged! (The most excellent Legendary Dartmoor website has more information). For those not in the know; in the world of stones logging means rocking (you know the sort of thing: Rock of Ages, Rock around the Clock and Rock the Kasbah). Logan stones are big rocks balanced on small bits of rock; they are not built by seesaw-loving giants, but are the result of natural erosion. 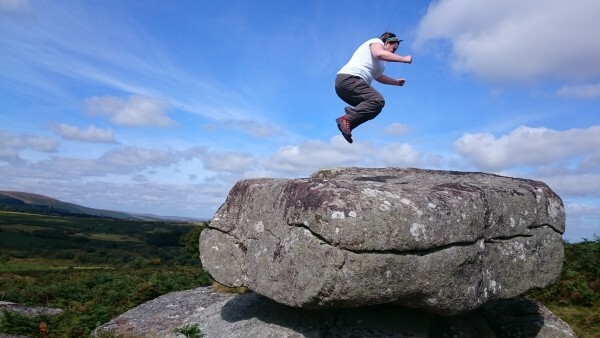 There are a few logan stones marked on Dartmoor maps and discussed in Dartmoor history tomes. We Blondes have yet to manage to move one; but the other day Not-at-all-Blonde and I were visiting Bowerman’s Nose when we found a likely candidate. We decided to do a bit of Blonde research, which started with Not-at-all-Blonde observing, while I tried to move the topmost rock. All to absolutely no avail, but accompanied by shed-loads of laughter. If you are ever up on Hayne Down (where you really should be reading your copy of ‘The Non-Story of Ignatius Bowerman‘) you could do a bit of experimenting yourself. Go on you know you want too! By the way, Not-at-all-Blonde returns to university near those beautiful Derbyshire Peaks tomorrow. I am going to miss her more than I thought I would! You remind me of something slightly similar, but really quite naughty. Mainly in the world of rock climbing there is a subversive pass-time referred to as “trundling”. It involves rolling large stones off down hillsides – it is highly addictive encouraging the trundling of larger and larger rocks. Of course I have never participated?! BUT I always had an ambition to trundle the Calf Rock at Ilkley down into the town. The photo from the link below shows the Calf above the town. The rock is about 30/40ft high with large bucket holds chiselled out – we used to solo (no ropes) round the routes shown with red dots. That really is very naughty, but I can see the attraction, maybe that is where cheese rolling originates! 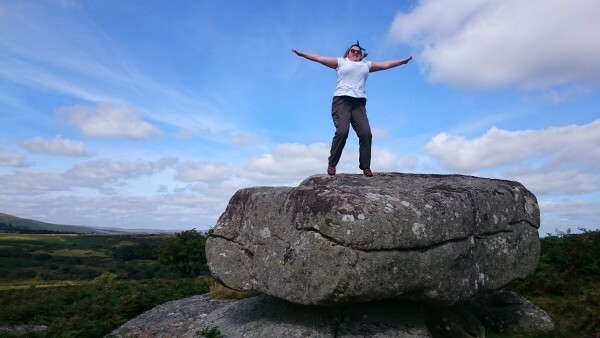 I don’t know which terrifies me more – the thought of being down-the-hill from any of the stones – whether they were rocking or rolling – or the thought of trying to climb all round Conrad’s red dots without a safety harness! Well, no! Let’s be honest – nothing, but nothing would ever get me rock climbing! Have a terrific term, Not-at-all-Blonde.